Designed by Bob Dozier lightweight and compact EDC folding knife, smaller version of Dozier Folding Hunter model. Its simple design is easy to clean, easy to sharpeen blade remains sharp for long time. Hunter-type blade is made of high quality AUS-8A stainless steel. It is covered with matt black coating to protect against glare and corrosion. The knife opens with a thumb stud, which has the ability to be fitted on the right or left side of the blade. Against accidental blade closing protects a solid Lock Back. Non-slip texture linings in strong Toxic Green color are made of durable GFN-PA66 polymer. 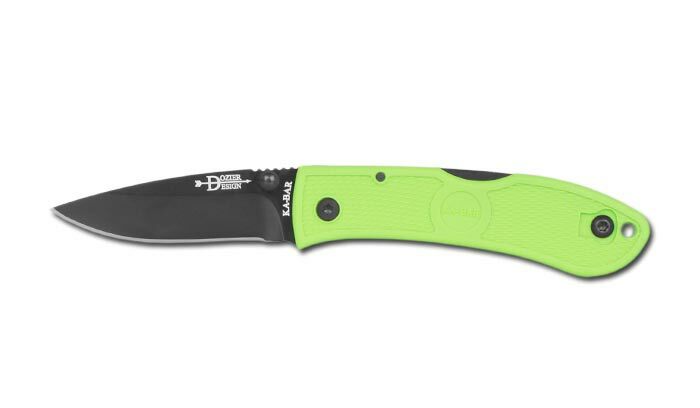 The knife has a stainless steel clip and lanyard hole. Clip can be mounted on the left or right side of the handle.